Tim Lodge has been working with the Hurlingham Polo Association for almost 20 years advising their members on ground maintenance and construction. He has also provided annual seminars for the grounds staff and owners. Clients have included the big clubs of Guards, Cirencester, Berkshire, Beaufort and very many private grounds throughout the UK. His work in polo has also taken him overseas including south west China, Texas, southern Spain, Turkey, Morocco and Germany. Largely arising from the work in polo, Tim has accumulated expertise in other equestrian surfaces including arenas, gallops and training tracks. Clients have included Badminton and many private facilities. He also lectures occasionally to the Open College of Equine Studies, a distance learning facility based in Suffolk. Agronomy services to polo and equestrian facilities are tailored to each particular circumstance in order to meet our clients' requirements most precisely. With a comprehensive range of technical evaluation procedures to call upon (see Technical Services) advisory work can be as simple or as detailed and substantial as required. Call to discuss how we can help. Being an independent consultancy, we won’t try to sell you anything but we’ll happily point you in the direction of particular products or machinery if we feel they are what would be of greatest benefit to you. Where reconstruction or more significant development work is called for this will also be pointed out and discussed. 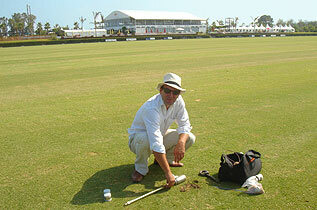 Some years ago, Agrostis worked with the HPA to establish performance quality standards for polo grounds. The standards relate to measures of ground cover, pitch dimensions, surface evenness, slope etc. We are equipped and experienced in taking all of these measurements and, in reporting to you, we will advise you on what to do if for any reason your ground falls short on one or more of the measures. It is strongly recommended that grounds new to the HPA should be assessed according to these standards, and the HPA duly informed, in order to facilitate the playing of HPA tournaments on them. Polo training track surrounding stick and ball ground. Agrostis project. Drainage installation and early mowing of new polo ground. Agrostis project.